“§ 89D-12. License required; use of seal; posting license. 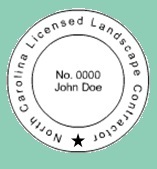 (d) Upon licensure by the Board, each landscape contractor shall obtain a seal of the design authorized by the Board and bearing the name of the licensee, the number of the license, and the legend ‘”N.C. Licensed Landscape Contractor.” A landscape contractor may use the seal only while the license is valid. Seal should be used and embossed on all agreement and contracts. Please Note: If questioned by the office supply business, the Seal should be considered similar to a corporate or business seal and NOT a NC State Government Seal or Notary Seal. Every landscape contractor issued a license under this Chapter shall display the license conspicuously in the landscape contractor’s place of business. 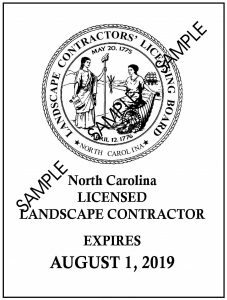 Every landscape contractor shall display the license number issued to the contractor by the Board on all business cards, advertising, contracts, and vehicles used by the contractor in the landscape contracting business.